The new Tomb Raider reboot, like the 2001 film, hands the reigns of one of gaming's most beloved characters to a young, newly minted Oscar winner in the hopes of not only jump-starting a potential franchise but finally erasing the stigma of the "video game movie". If any video game property is finally going to break through and be a mainstream hit that's actually a pretty good movie, Lara Croft is as likely a kickass heroine as any to do it. Inspired by the successful reboot of the video game franchise itself, 2018's Tomb Raider aims to take the "best video game movie" crown from... well, probably 2001's Lara Croft: Tomb Raider (though let's be honest here, that's not a very high bar.) Whether or not Tomb Raider does is up for debate, but it certainly does try hard. 2018's Lara Croft is Academy Award winner Alicia Vikander (The Danish Girl). Like the rebooted game series, Vikander's Croft overhauls the voluptuous gaming icon as a gritty, spunky thrill seeker living in the long, dark shadow of her wealthy but mysterious father, missing for nearly a decade and long feared dead. Just as acceptance sets in, Lara starts to follow the clues he left behind, leading her to a mysterious island on the other side of the world. Naturally, the bad guys are already there waiting, and they want the MacGuffin too. Vikander is a natural Croft. Besides being a dead ringer for the rebooted video game character, she completely nails the toughness and vulnerability that give her much-needed depth. Vikander is clearly up to the task of carrying the film and taking on such a famous character. The supporting cast is solid as well, with an impressively evil turn by fan favorite Walton Goggins (Justified, The Hateful Eight) as boilerplate bad guy Mathias Vogel, giving everything he's got to what is otherwise, unfortunately, a two-dimensional character. Herein lies the problem of Tomb Raider 2018. Though it tries harder than most, there are plenty of moments where the film falls victim to the suffocating paradox that plagues all video game movies; too much like the game and it's gimmicky, not enough of the game and it's nothing special. It almost feels like the film can't decide if it wants to remind you of the game or make you forget it entirely, even at times in the same scene. In addition, the Croft character is hindered by a lack of tangible stakes. While in the game you're one poorly aimed pickaxe hit away from falling to your death, the knowledge that our movie star hero is probably going to be just fine cuts into that dramatic tension a bit. Director Roar Uthaug's previous film, the 2015 Norwegian film The Wave, is a capable thriller that easily falls victim to disaster movie tropes. 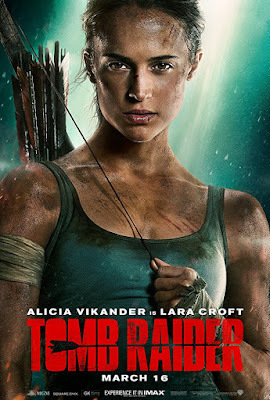 The same description could be applied to Tomb Raider, which owes so much to a certain other Raider that it would not be the least bit surprising if Vikander donned a fedora and cracked a whip. As inspiration goes one could do a lot worse, but it would have been nice to see Uthaug and writers Geneva Robertson-Dworet and Alastair Siddons think outside the mystery box a bit. Speaking of the mystery box, Vogel's employer is shrouded in vague mystery if even acknowledged at all, turning the inevitable dramatic reveal into a bit of a shrug. There are obvious shortcomings to Tomb Raider, but not enough to make it by definition a bad movie. It may not feel like the video game, but it's still an entertaining, if a bit light on substance, adventure movie. As expected the film clearly aims to make Croft a movie franchise heroine. If audiences agree, and we get to see more of Lara Croft's big screen adventures, it would be nice to see future films take some more chances and possibly even elevate the stakes a bit. As it stands, though it never quite reaches the highest level, Tomb Raider manages a high score for a fun but ultimately disposable adventure movie.